This is a beautiful fixture but the limited bulb wattage doesn't allow for a very bright light. It's subdued without a dimmer!! This stunning 4-light Ceiling Light only uses the best quality material and workmanship ensuring a beautiful heirloom quality piece. 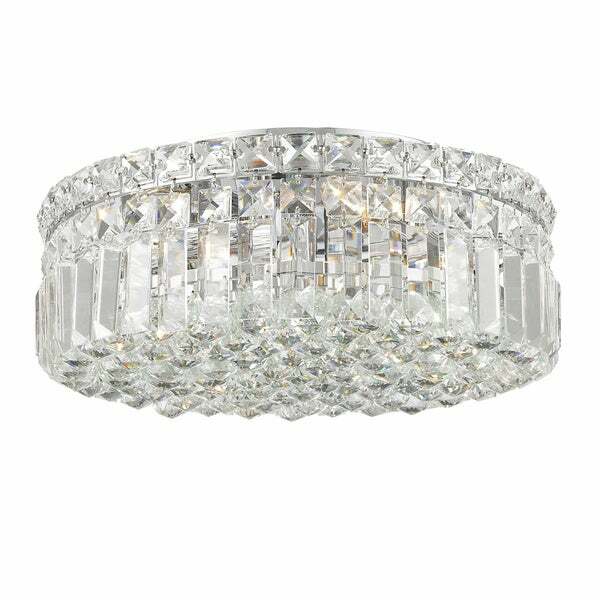 Featuring a radiant chrome finish and finely cut premium grade crystals with a lead content of 30-percent, this elegant ceiling light will give any room sparkle and glamour. Dimensions 14.0 In. X 14.0 In. X 5.5 In. This crystal flush mount fixture was sent to me as a replacement for a previously defective one. Unfortunately, as with the previous fixture, this was also has defective poor quality crystals. Many were damaged as well with chips on the corners and sides. They were also quite dirty. They were packed touching each other--not how I would expect glass to be shipped.